Background: The oral cavity might well be thought of as the window to the body as the extent of the inflammatory burden caused by periodontal disease can influence systemic diseases with a similar inflammatory pathology and vice versa, raising the relevance regarding periodontal and systemic health affecting each other. With the aim of assessing oral health knowledge and orientations of physicians, we surveyed medical interns and post-graduates about their general knowledge, attitudes, and behaviors/practices about periodontal health and disease. Method: A 15-question survey was equally distributed among the Group A (25 medical interns) and Group B (25 medical post-graduates) at a single medical college hospital. Questions aimed to assess the knowledge levels of the subjects about periodontal disease and their attitudes toward discussing/evaluating the periodontal status of their patients. Results: Overall the basic understanding about periodontal disease was limited among both the groups, 60% Group A and 84% Group B reported that they never asked patients if they were diagnosed with periodontal disease, 88% and 100% of Group A and Group B reported not receiving any training about periodontal disease during medical school, 44% Group A and 100% Group B felt that discussing/evaluating the periodontal status of their patients was peripheral to their role as physicians. Conclusion: In this study, both the groups had inadequate knowledge regarding periodontal disease. They were also generally uncomfortable with performing a simple periodontal examination. Oral health training in medical school and the medical post-graduate setting is recommended. Periodontal disease involves an inflammatory process that develops in the gingiva in response to bacterial antigens in tooth plaque. A physician‘s examination of the mouth usually involves a -Say ‗Ahh..‘ and a quick look at the pharynx. Unfortunately, this brief examination is likely to miss important, clinically relevant information . In a report for the National Commission on Macroeconomics and Health (NCMH), periodontal diseases among the Indian population projected a prevalence of 45% for 15+ years group, and the actual prevalence in lakhs will be 2957.6 (year 2000), 3190.2 (year 2005), 3413.8 (year 2010) and 3624.8 (year 2015). If minor periodontal diseases are included, the proportion of population above the age of 15 years with this disease could be 80% to 90% . Physicians and dentists have restricted themselves to their own respective fields in the past, only treating diseases that are relevant to their own fields of specialization. However, recent findings indicate that oral health may influence systemic health, and that this may be a bi-directional relationship for some conditions such as cardiovascular problems, pulmonary conditions, diabetes mellitus, osteoporosis, obesity, pancreatic cancer and Alzheimer‘s disease [3-7]. This inter-relationship exemplifies a cyclic association, whereby a systemic disease predisposes the individual to oral infections, and, once the oral infection is established, it exacerbates the systemic disease . Hence, emphasis should now be place on treating periodontal and other chronic dental disease as a means of ameliorating systemic disease . Nevertheless, few studies examined a physician‘s role in identifying, discussing or preventing oral disease and only focused on children . With the aim of assessing oral health knowledge and orientations of physicians in training, we surveyed medical interns and post-graduates about their general knowledge attitudes, and behaviors/practices about periodontal health and disease. A structured questionnaire survey which is closed-ended; consisting of 9 dichotomous and 6 likert-scale questions; were equally distributed among the Group A (comprise 25 medical interns) and Group B (consist 25 medical post-graduates), at a single medical college hospital. Ethical clearance was duly obtained from the institutional ethics committee. Questions were aimed to assess the knowledge levels of the subjects about periodontal disease and their attitudes toward discussing/ evaluating the periodontal status of their patients. The participation was voluntary and anonymous. Respondents were instructed to circle the best answer. The questionnaire was completed in approximately 15 minutes. Analyses were performed using Fishers exact test and chi-square test by SPSS 17. The survey was given to a total of 50 medical professionals. The Group A responders were graduating from the same institution, on the contrary Group B had graduated from different medical schools of the nation. Although Group B demonstrated knowledge (statistically significant) regarding the signs of periodontal disease and its association with diabetes and cardiovascular disease, nearly half of both the groups did not know about the association of periodontal disease with increased levels of systemic markers (Figure 1). Clinical practice behaviors/orientations were interpreted in Figure 2 while 60% and 84% of both Group A and Group B never asked their patients if they had ever been diagnosed with periodontal disease, only 8% Group B among both the groups admitted to have good knowledge regarding the same. Figure 1: Percentage of subjects achieving correct answers on the first five true/false knowledge items of the questionnaire. Figure 2: Questions exploring clinical practice behaviors/orientations. As shown in Figure 3, among both the groups, only 4% of Group B often referred their patients to a dentist regardless of the fact 16% Group A and 80% Group B had felt that about half of all pregnant women show increased severity of gingival inflammation. Both Group A (88%) and Group B (100%) accepted receiving insufficient awareness about periodontal disease in medical school. 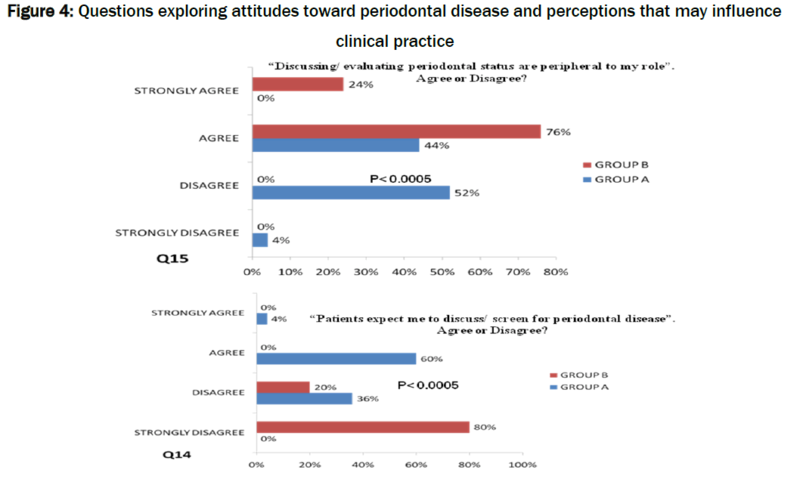 Finally Figure 4 highlights the complete disagreement of Group B (100%) towards the statement that their patients expect them to discuss about their periodontal disease contrary to Group A and they agreed that discussing or evaluating periodontal disease was peripheral to their role as physicians. Figure 3: Questions exploring perceived knowledge and training. 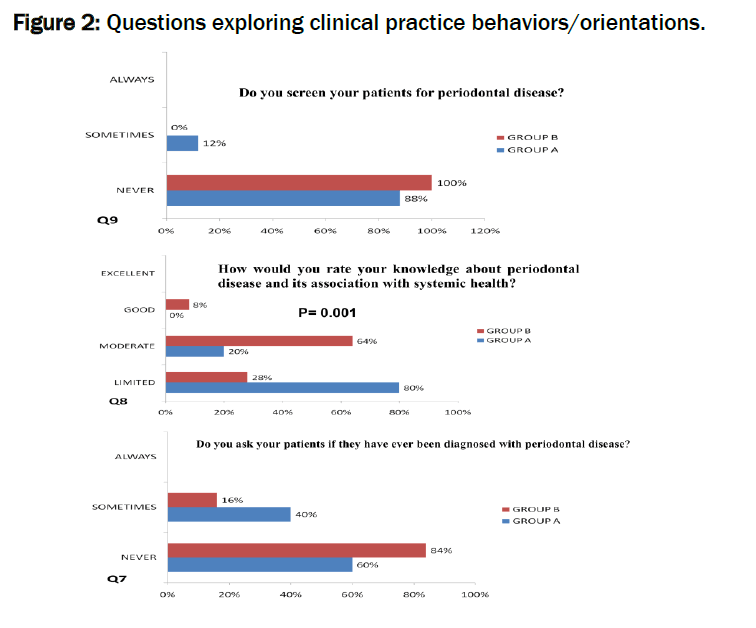 Figure 4: Questions exploring attitudes toward periodontal disease and perceptions that may influence clinical practice. In a field of health, ―helping people to help themselves should be as important as direct service. Indeed if one concentrates upon prevention of disease and the attainment of positive health habits rather upon the cure of the disease, self-help is much more than half the battle. The promotion of overall health and a reduction in health inequalities can be achieved only by means of an equitable distribution of health services; focus on prevention; appropriate technology; multisectoral approach and effective community participation. This study was mainly aimed at physicians as they are the primary channel for reaching the people and imparting information about health in such a way that the recipient is motivated to use that information for the protection or advancement of his own, his family‘s or his community‘s health. The evidence based decision process has led to the inclusion of periodontal disease as one out of 15 target disease for screening by any general practitioner . In the present study, limited knowledge about periodontal disease is observed among both the groups. In contrast to various studies [12,13], it has been found that majority of the medical interns (80%) admit their limited knowledge about periodontal diseases whereas the post-graduates (64%) show a moderate level of knowledge (Figure 2) in spite of the fact that 60% of the medical interns showed their awareness that bleeding gums, gum recession, unsteady teeth, and tooth loss are signs and symptoms of periodontal disease; on the contrary only 40% of the post-graduates were aware of it (Figure 1). This implies though significance of oral hygiene and maintenance of dental health is highlighted in medical school (MCI 1956), it is not fairly practiced overall, as evident among the post-graduates who are graduates from various universities. These findings raise concern. The World Statistics 2012, released by the World Health Organization (WHO), says India has less than 1 dentist (0.8) per 10,000 populations. Given the high prevalence of periodontal disease and its deleterious impact on oral and systemic diseases; an increased awareness among the physicians is often expected to provide the public with proper education and guidance regarding the same. The study suggests a higher necessity for the medical schools to have a more comprehensive training in oral/ periodontal health. Various strategies that can be implemented to achieve this goal include usage of audiovisual aids, having fixed dental postings – enabling them with sufficient theoretical knowledge and reinforcement sessions by means of instructions on prevention counseling at the outpatient counter; which would improvise the future efforts of physicians‘ in contributing to the oral health. Growing evidence states that periodontal disease is associated with an increased risk of systemic illness, which pose a compelling reason for physicians to enquire about oral health care and hence the need for greater collaboration between dentists and physicians. Within the given limitations of the present study including smaller sample and individual responder bias; oral health education in medical school and the post graduate setting is highly recommended. Parks ET, Lancaster H. (2003) oral manifestations of systemic disease. Dermatol Clin 21: 171-182. Shah N. (2005) National Commission on Macroeconomics and Health, Ministry of Health and Family Welfare. New Delhi: Government of India; 2005. Sep, Oral and dental diseases: Causes, prevention and treatment strategies In NCMH Background Papers—Burden of Disease in India (New Delhi, India). 9: 275–98. Xiaojing Li, Kristin M Kolltveit, Leif Tronstad, Ingar Olsen (2000) Systemic diseases caused by oral infection. Clin Microbiol Rev 13: 547-558. Howard Howell, Paul M Ridker, Umed A Ajani, Charles H Hennekens, William G Christen (2001) Periodontal disease and risk of subsequent cardiovascular disease in U.S. male physicians. J Am Coll Cardiol 37: 445-450. Teng YT, Taylor GW, Scannapieco F, Kinane F and Curtis Mike et al. (2002). Periodontal health and systemic disorders. J Can Dent Assoc 68: 188-192. Williams RC, Barnett AH, Claffey N (2008) The potential impact of periodontal disease on general health: A consensus view. Curr Med Res Opin 24: 1635-1643. Friedewald VE, Kornman KS, Beck JD (2009) The American Journal of Cardiology and Journal of Periodontology editors’ consensus: Periodontitis and atherosclerotic cardiovascular disease. J Periodontol 80: 1021-1032. Marvin E Herring, Shiwan K Shah (2006) Periodontal disease and control of diabetes mellitus. J Am Osteopath Assoc 106: 416-421. Tara B Taiyeb-Ali, Renukanth P, Cheta Raman, Rathna D Vaithilingam (2011) Relationship between periodontal disease and diabetes mellitus: an Asian perspective. Periodontol 56: 258-268. Gonsalves WC, Skelton J, Heaton L, Smith T, Feretti G et al. (2005). Family medicine residency directors’ knowledge and attitudes about pediatric oral health education for residents. J Dent Educ 69: 446-452. Luciak-Donsberger C, Pribauer F (2007) evidence based rationale supports a national periodontal disease screening program. J Evid Base Dent Pract 7: 51-59. Aimee Quijano, Amit J Shah, Aron I Schwarcz, Evanthia Lalla, Robert J Ostfeld (2010) Knowledge and orientations of internal medicine trainees toward periodontal disease. J Periodontol 81: 359-363. Rebecca S Wilder, Katherine M Thomas, Heather Jared (2008) Periodontal-systemic disease education in United States dental hygiene programs. J Dent Educ 72: 669-679.